The identity of the firm and the foreign country at issue remain closely guarded secrets, but POLITICO first reported earlier this year that the dispute appeared to involve Mueller’s prosecutors. The foreign-government-owned company filed an application Saturday to Chief Justice John Roberts asking for a stay of the federal appeals court ruling turning down the company’s effort to block the grand jury subpoena for records. 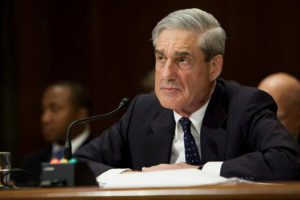 [Saturday] afternoon the Supreme Court was asked to step into a clash over a grand jury subpoena that is widely believed to be related to Special Counsel Robert Mueller’s investigation into interference in the 2016 election. In a filing made under seal, an unnamed corporation – owned by a foreign country identified in the lower court only as “Country A” – apparently asked the justices to block the subpoena after the lower courts refused to do so. The case had been kept under wraps when the U.S. Court of Appeals for the District of Columbia Circuit heard oral argument last week, with courthouse security officers not only closing the hearing to the public but also locking down an entire floor of the courthouse. [The] filing was under seal, so there is no way to know exactly what arguments are being made. However, the D.C. Circuit also rejected the corporation’s contention that the district court lacked power to hear criminal cases, such as this one, against foreign countries and the corporations that they own. In so doing, the court of appeals acknowledged that the Supreme Court’s earlier statements had not provided any “clear answer in this case” – which could also be the basis for the corporation’s plea. [The] filing went to Chief Justice John Roberts, who handles emergency appeals from the District of Columbia and can either act on the request himself or refer it to the full court. The next step will likely be to call for a response from the federal government, although that too will almost certainly be under seal. UPDATE: On Sunday evening, Chief Justice John Roberts temporarily blocked the district court’s order requiring the foreign corporation to comply with the grand jury subpoena or pay penalties. In a brief order, the chief justice directed the government to respond by noon on December 31 and indicated that the district court’s order would remain on hold until the government’s response is filed and either he or the full court takes additional action. The Supreme Court has a conference scheduled on Friday, January 4. They will likely hold a vote to decide whether to hear this appeal then, or Chief Justice Roberts could issue additional orders on his own. Stay tuned. At Law.com, Tony Mauro observes that if the case reaches the Supreme Court on the merits, past history suggests that the justices are not likely to “clear their court chamber like the D.C. Circuit did, and leave the public and press outside, scratching their heads.” (h/t SCOTUSblog).